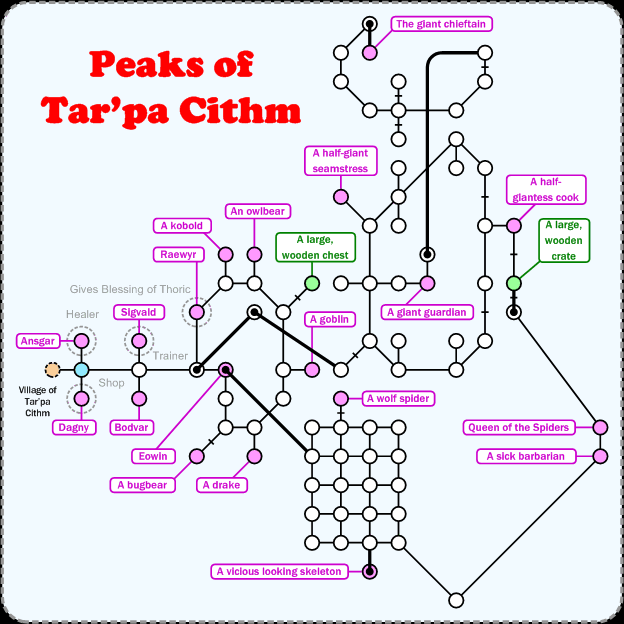 The Peaks of Tar'pa Cithm is the equivalent of the Halls of Knowledge (aka the Academy), exclusively for the barbarian class. Barbarians start the game here and can get all the things that other classes get from the Halls of Knowledge (in fact, a little more). Only barbarians can get in, and even they can't get in after level 20. Walk ( nw, 2w, 4n, e, look painting, open n, n, 28w, 3s, 3d, 5w, 2nw, 3w, 4sw, 3nw, 3w, sw, s, 3e, 2s, se, 4e, ne, e, s, 2se, e ) to get from DH to the room marked in blue.